. 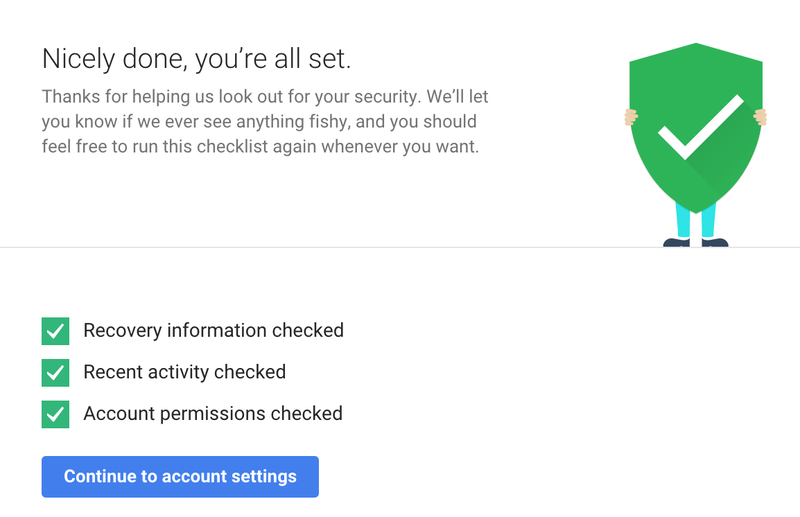 While everything stored in Drive is always encrypted in transit and at rest in Google’s custom-built data centers, this checkup ensures you’re making the most of the 24/7 protection you already get from Google. As our way of saying thanks for completing the checkup by 17 February 2015, we’ll give you a permanent 2 gigabyte bump in your Google Drive storage plan. Reviewing this lets you validate the sign-ins are coming from you and not someone who shouldn't be using your credentials. This step lets you monitor this list and remove apps and devices that don't need access to your account any more. After you’ve gone through the checkup successfully, you’ll see three green checkboxes (see below) that confirm you’re eligible for the free storage and, more importantly, that you’ve taken steps to enhance your online safety. We’ll be granting the storage automatically to everyone around 28 February 2015 and we’ll send you an email when your adjustment is complete. Ideally, you’ll revisit this checkup every so often or anytime your account changes, like when you get a new phone or replace an old laptop. While this is just one way to help you stay safe online, you can find even more tools and tips in the Google Safety Center. UPDATE: Google Apps for Work and Google Apps for Education users are not eligible for the bonus storage but should still consider taking the Security Checkup.